The Golden Gate is inescapable. Draped in cloud, drenched in sun, swept clean by inexhaustible tides, the Gate and the bridge are always there, dutifully magnificent, stoically radiant. The Golden Gate anchors the San Francisco we carry around in our heads. City by the Bay. Gateway to the Pacific. City on the Hill. It fills the postcard, frames the visit, defines the experience. It captures the imagination of all who pass by. But in and around the Golden Gate there is a great deal that does not readily come into focus. Beyond the magical realism of these photographs lies the geographic magic done by the hand of nature and humankind. The hidden geography of the Golden Gate can be seen in the rocky points and moldering piers cloaked in gray, in stipples of green and brown along the shore, in dots of brick and mortar tucked into the coastline. But it must also be called up from hidden places of collective memory, these clouds of history. The Golden Gate as seen from the Berkeley hills, 2011. 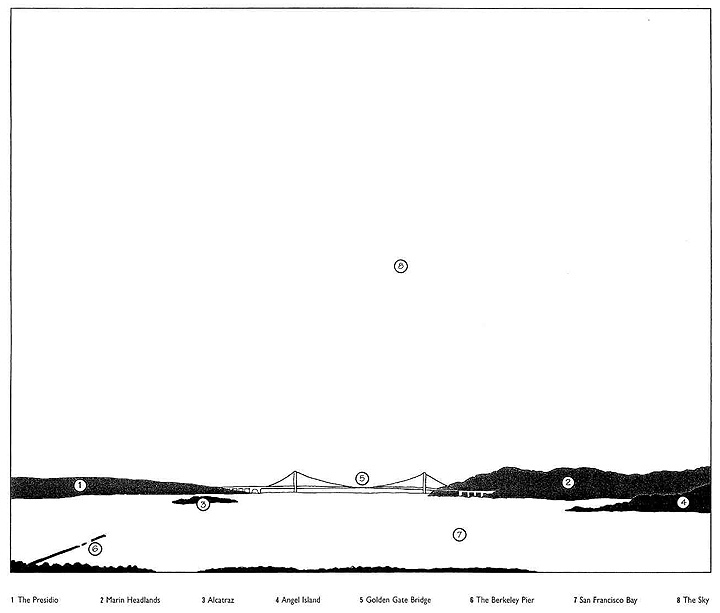 The Golden Gate is defined by two headlands: the Presidio to the south (left) and the Marin Headlands to the north (right). Without these nubs of land, no narrows, no bay, no Golden Gate. Land's end, beginning. The Presidio began life in 1776 as the northernmost reach of the Spanish empire. The projection of the crown's sovereignty into California was a last gasp of an imperialism that had overreached itself. Militarily, the Presidio did little except warn off the Russians camped at Fort Ross. But behind its protection came the "civilizing" mission of the Franciscans and the Spanish army. Five missions and three pueblos were founded around the bay, and ten thousand years of native habitation was broken on this fatal shore. After 1810, independent Mexico carried on the Spanish project of pacification and economic development with a zeal that belies romantic notions of sylvan early California. Ambitious Californios were bourgeois radicals and anti-clericals who saw to the secularization of the missions, parceling them out in cattle ranches. Mariano Vallejo, the military rule of the northern border, abandoned the Presidio in 1835 and set himself up as a princeling in the North Bay — reflected in the place names Vallejo, Sonoma (his home), Benecia (his wife) and Solano (his chief warrior). The name Marin is a backhand compliment to a native leader who proved an able marinero escaping from Mexican troops. The imperial mantle passed on to the Americans. After annexing California in 1846-48, the pugnacious U.S. government seized the lands around the mouth of the bay for battlements to guard its Pacific flank. Fort Point, on the south shore of the gate, was the chief fortification. The Presidio was the headquarters for the western army, which looked inland not to the sea for the first fifty years. The installations around the Golden Gate served as a staging area for campaigns against the Yurok, Paiute, Apache, Sioux, and Modoc. In 1916 troops under the command of General John Pershing were dispatched from the Presidio to pursue Pancho Villa into revolutionary Mexico. Lessons in continental conquest were put to good use in the anti-insurgency campaign against the independence movement when the United States seized the Philippines in the Spanish-American War of 1898. After that, the military adventures of the United States were mostly undertaken in the Pacific. The Bay Area was the logistical pivot for men, materials, and munitions heading westward. World War II brought enormous new facilities into play at Oakland, Treasure Island, Moffett Field, Travis, Alameda, and Port Chicago. From the Presidio, General John DeWitt conducted the wartime internment of thousands of Japanese Americans on the West Coast. The Bay Area repeated its role as the supply fulcrum of the Pacific theater during the Korean and Vietnam Wars. Today the forts, naval batteries, and Cold War missile silos stand as mute witnesses to the endless obsolescence of military technology. The Presidio, having acquired the luster of age and respectability, has been made into a historic landmark and national park. The idyllic view of the Golden Gate we see today owes much to the military keeping the developers at bay, so that the headlands would remain largely open and green. The Presidio is now part of the Golden Gate National Recreation Area, the largest urban national park in the country. It is also the first privatized national park, run by a Presidio Trust set up by a tight-fisted Congress in 1995. The Trust has ignored much of the Park Service's master plan to seek wealthy lessees like George Lucas, movie mogul, for the valuable buildings under its control. Cries of outrage have been many, but if the Presidio is not self-financing it must be sold off for real estate pottage. Bucolic Marin was long bypassed by the main currents of history. Its open spaces housed the Coast Miwok, the first people encountered by Europeans entering the region. Father Vincente, who arrived to claim the bay with Captain Ayala in 1775, wrote, "I found the Indians very humorous, with courteous manner, mimicking my prayers with chuckles — they acted like tender lambs, had fine stature, clean and of good color, very elegant of figure." The natives left enormous mounds along the Marin bayshore, and around the bay, at sites of encampment and ceremony, filled with jewelry, tools, and leftovers from their abundant dinner table in this generous land. Nowhere was the annihilation of Native Americans more complete. Although the Coast Miwok people resisted the Spanish and Mexicans for decades, they eventually fell before superior firepower. In under a century, only a few dozen Indian survivors remained in what had once been one of the most densely populated Indian lands on the continent. After the Gold Rush, squatters and speculators got busy in Marin, but not much came of it. The great wheat boom passed up Marin for the plains of Sonoma to the north, triggering the growth of Petaluma. Marin remained an open country of grazing and milk cows, leading the state in fresh milk production from the 1850s to the 1890s. Dairies remain a staple of Marin to this day, protected by special agricultural zones. Even the military emplacement on the headlands, Fort Baker, was hardly used. By the 1890s, weekend excursions and vacation homes had become the main income earner for Marin, centered on Mill Valley and San Rafael. A heady little railway was built up the flank of Mount Tam for the views. Sausalito achieved notoriety briefly with the antics of William Randolph Hearst, who lived there in his early days, and the spillover from the Barbary Coast. But the bluenoses closed down the whorehouses and gambling joints in 1909. Marin's fortunes turned up with the great 1906 earthquake which led many San Franciscans to decamp permanently across the waters (ironically, closer to the epicenter). Ross, Kentfield, and Tiburon, sheltered from the fog, became redoubts of the rich. Eventually, Marin surpassed San Mateo County as the most glamorous residential acreage in the Bay Area, and today it has the highest income per capita in the western United States. With no water, little vegetation, and a thick coat of guano, Alcatraz Island held slight promise for habitation. But men of war saw its potential. By the Civil War, the island was the most fortified spot in the western United States. When the army was through gouging, a soft hump in the bay had become "the Rock," a sharp-edged promontory and the most recognizable feature in the Bay. But the fortifications could not keep up with improvements in artillery, so the military abandoned the effort. By the end of the century, Alcatraz acquired a new function as a military jail. It had held a handful of prisoners before — Indian warriors, Confederate sympathizers, army deserters — but the number of malefactors jumped with the dirty little war in the Philippines. A three-story jail house (still clearly visible) was added atop the island. On completion in 1912, it was the largest reinforced concrete building in the world. The Alcatraz of world fame is the federal penitentiary that replaced the military prison in 1934. This "super prison," reserved for the worst intransigents in the federal system, was the mad invention of J. Edgar Hoover of the FBI. Hoover declared the first national War on Crime in the 1920s, out of equal measures of police rectitude, social paranoia, and political ambition. He needed high-profile criminals, so he made household names out of people like Al Capone and Bonnie and Clyde, and he needed a high-profile prison for the FBI's famous catches. That was Alcatraz. Remodeled along the most modern lines of the correctional arts, Alcatraz featured electronic gates, steel alloy bars, vigilant censorship of reading materials, a ban on talking, and isolation cells. It also featured prisoners driven insane, bloody rebellions, and famous escapes. When liberal public opinion turned against the hard-knocks school in the late 940s, Warden Johnson was replace and the rules relaxed. Alcatraz became Hoover's albatross and was closed 1962. Declared surplus government property, it lay rotting in the salt air. Burt Lancaster's fantasy, The Birdman of Alcatraz (1962), marks the change of heart about crime and punishment that took place in that era. In November 1969, a group of Native American students invaded Alcatraz, declared it liberated Indian territory, and demanded federal funding for a native university and education center there. Their boldness inspired the American Indian Movement of the next decade and led the federal government to recognize Indian self-rule and land claims across the country. The Bay Area rallied to the cause, sending food, money, and supplies to an occupation that lasted more than a year. Why were so many young Indians on hand for the occupation? Because of a draconian federal policy of tribal termination that displaced 40,000 people to the Bay Area alone. But the nation's heart has hardened again. Revanchism was already evident in Clint Eastwood's Dirty Harry (1971), a tale of blue-coated revenge against the free streets of San Francisco, coming the same year as Nixon declared a new War on Crime to quell the fires of the 1960s. California led the way with 23 new prisons and a prison population jumping from 20,000 to 160,000. Alcatraz looks an airy paradise compared to overcrowded Calpatria and Corcoran. But the spirit of the Rock hovers over the new gulag. At Pelican Bay super-maximum security prison far up the coast, a third of the prisoners have been rendered certifiably mad under a brutal regime of isolation, lockdown, observation and torment. Ironically, Alcatraz means pelican. Alcatraz is now a tourist site run by the National Park Service, a movie set rubbed smooth by time and myth. The main cellblock still stands, and old graffiti silently proclaim this Indian territory. Strikingly, a feast of flowering plants, once tended by prisoners, runs wild amid the ruins. Birds are everywhere. Natural and human spirits haunt its desolation. Angel Island is the largest island in the bay, separated from Tiburon by the deep waters of Raccoon Strait. It long served as a way station for the ships of conquistadors, traders, and whale hunters, who called it Wood Isle, then was annexed by the Union in fear of a Confederate navy that never came. Afterward, Camp Reynolds became a staging area for the Indian campaigns. During the Spanish-American war, a new garrison was added at Quarry Point, and the whole operation rechristened Fort McDowell. A gigantic barracks (seen at the lower right of the photographs) was built by convicts from Alcatraz. Between the world wars, Fort McDowell handled tens of thousands of troops every year, the largest staging area in the country. It closed after World War II. The island became the "Guardian of the Western Gate" in another fashion when a quarantine station was opened at Ayala Cove. Ships from foreign ports were fumigated and immigrants held in isolation. The quarantine drive came in the midst of rabid anti-Chinese agitation, and the China was the first ship to be stopped, in 1891, with smallpox on board. This incident fed the white man's medical hysteria about scourges arriving from the Far East, which almost led to the removal of San Francisco's Chinatown altogether. The station operated for another half-century. China Cove on Angel Island served as the Ellis Island of the West after 1910, after too many hopeful arrivals had jumped ashore at the San Francisco docks. A rush of Europeans arriving by way of the Panama Canal never materialized; Asians came instead — some 175,000 Chinese, 20,000 Japanese picture brides, and others from Russia, Korea, the Philippines, and the Pacific islands. Passage was more difficult here than in New York because of the Chinese Exclusion Act, passed at the behest of white Californians in 1882. Many Asian immigrants were sent back, while others entered the United States by purchasing new identities as "paper" sons, wives and daughters. The loss of civil records in the fire of 1906 aided their cause, but prolonged the interrogations as immigration officials tried to verify relatives in the United States. My parents are old; my family is poor. Cold weather comes; hot weather goes. The central immigration building burned in 1940, and the station closed down. Soon after, the Exclusion Act was repealed since the Chinese had become U.S. allies in the war against Japan. The station is now a national historical monument, and the era of exclusion has faded in memory. Yet interdiction of undocumented migrants, forgeries of papers, bogus high-tech visas, and long interrogations remain staples of immigration into today's California. The capstone of the pictorial landscape is the Golden Gate Bridge. Its graceful arch is a proscenium for every passing ship. It is the clasp that cinches up the landscape. Both engineering marvel and architectural sculpture, it has universal aesthetic appeal and iconic status as one of the modern wonders of the world. One can hardly think of the Golden Gate without the bridge. Old photographs of the place look vacant and forlorn. 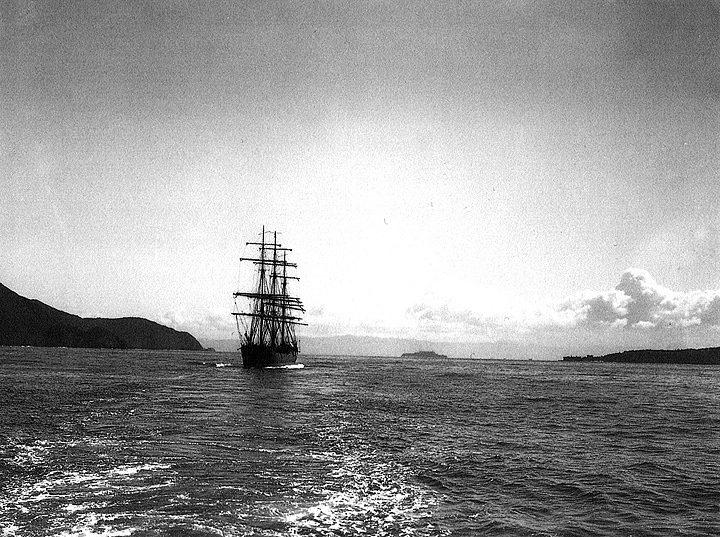 Star of Alaska in pre-bridge Golden Gate. When constructed in the early 1930s, the bridge represented a great leap forward in design. It was the longest and highest single span in the world, and made earlier bridges appear ponderous. The Art Deco elements, such as step-backs to make the towers appear taller, vertical ribbing to catch the sun, and angled lampposts, still look inspired. The burnished orange paint is a brilliant touch (the navy wanted the bridge painted yellow with black stripes for navigation purposes). The building of the bridge is a tale of modern heroics. Doubters were persistent, finances shaky, and political machinations lively. It took a decade to get the design right and the politics orchestrated, and four years to complete the job. Yet even before the first tower was finished, the magnificence of the accomplishment was apparent. The bridge became the perfect embodiment of American technological sublime — a love of machinery and steel every bit as strong as love of God, market, or nature. The project began in 1916, when San Francisco's regnant builder, Michael O'Shaughnessy, put out a call to see if the gate could be spanned. Joseph Strauss, inventor of the tilt-up drawbridge, leapt at the chance. He became the bridge's chief promoter for a decade, then official chief engineer. The flamboyant Strauss saw the project through all travails. He put together a team of the leading lights in bridge design. Leon Moisseiff of New York was the genius behind lighter and longer suspension bridges; Charles Ellis of Illinois was the brilliant professor who drafted the engineering plan; John Eberson of St. Louis, a theater designer, who first proposed the Art Deco look, was superseded by architects Irving and Gertrude Morrow of Berkeley, who provided the finishing touches — tower fluting, light standards, and golden color.. An equally capable group was assembled to oversee construction. Construction at the gate was a difficult proposition. Fast currents, wave action, freezing winds, and winter storms all hampered the work. Things were made easier by positioning the Marin tower just onshore, leaving only the southern foundation in deep water, hence the de-centered look of the bridge. For symmetry, the two side spans were made equal in length, but Strauss was able to save Fort Point (beneath the arched trestle) from the kind of giant concrete block poured at the northern end. Ironworkers needed sure feet and strong nerves, but were helped by the first safety net used on a major construction site. The unionized workers fought for the net, which saved nineteen lives. It failed only at the very end when a huge scaffold tore through it with ten men aboard. Fate, indeed. The Golden Gate Bridge is, for all the heroics, a product of its time and place: America at a moment of industrial triumph. The Bay Area was one of the world's great centers of construction innovation in the early twentieth century, birthplace of reinforced concrete, modern dams, and long-distance highways. Still, why build the bridge at all? One takes for granted that it ought to be there — but only in the aesthetic sense that the Pyramids ought to stand beside the Nile. Economically, the Golden Gate Bridge was on shaky ground. The area's key transport link was well understood to be from San Francisco to fast-growing Oakland and the East Bay, not bucolic Marin. The state and federal governments put their money behind the Bay Bridge, leaving the finances of the second bridge in question. The usual story is that agitation for a bridge came from commuters in Marin and Sonoma Counties, but they were too few to effect such a grand scheme. The political and financial muscle came from San Francisco capitalists who saw an opening to the "Redwood Empire" to the north. A rising Oakland was cutting off escape to the east and, under business kingpin Joe Knowland, had become a vociferous challenger for regional dominance. A coalition was cobbled together to raise the necessary funds. First, a special district stretching all the way to the Oregon border had to be created for the tax base to back up construction bonds, and a fervid campaign underwritten to win voter approval. Then the bonds had to be sold through a syndicate led by Bank of America. A. P. Giannini led an alliance of San Francisco businessmen in support of the enterprise, including both the Hearsts of the Examiner and the de Youngs and Camerons of the Chronicle. The bridge is a classic example of the circulation of private money to build public monuments to serve collective private interests. All the same, San Franciscans love their Golden Gate Bridge. A half million of them turned out to celebrate its fiftieth anniversary on May 24, 1987, and the mass of humanity nearly broke it. The weight flattened the fabled arch, but the bridge held fast. The ferries on San Francisco Bay passed into history after the bridges were built, victims of the Californian love affair with the automobile. Ferries had once been as thick as sardines, with 5 million passengers a year crossing to the Ferry Building, the world's second busiest commuter depot. But Joseph Strauss was disdainful of what he called "ferryland" and purposely left trolley rails off his bridge to not interfere with traffic. The Berkeley auto ferry pier, started by Golden Gate Ferry Company in 1929, shot out two miles into the bay. The pier could not have been more badly timed. The Depression hit, then the bridges, and it was soon out of business. The city of Berkeley later rebuilt the first two thousand feet as a recreational pier, but the rest remains a haven for flounder and a hazard to unwary boatmen. The pictorial juxtaposition of the bridge and the pier is delicious irony. The Golden Gate Bridge and the automobile became riveted at the hip. The bridge was the missing link tying together the northern and southern halves of the magnificent Highway 101 running the length of California. Conversely, tolls from the cars passing over the bridge paid off the initial investment after thirty-five years. Yet the Golden Gate Bridge District remains politically aloof from regional government and transportation policy. This is typical of the Bay Area, with its cacophony of hundreds of cities, counties and special districts, which has resisted all efforts at meaningful governmental consolidation. A drive across the bridge was once a vision of secular-vehicular paradise, the stuff of California Automobile Association brochures. But the bridge triggered a gold rush for landowners in the North Bay. In the 1950s the threat of a second freeway up the coast and massive developments triggered the fight to save Point Reyes and open space in Marin county. Today, dense commuter traffic pours southward from the fastest growing region of the Bay Area, Sonoma county. The bridge of steel seems to calve metal babies rushing from shore to shore, and the cars give birth, in turn, to wall-to-wall housing tracts in the Russian River country. A revived conservation movement is now fighting to save remaining open lands from the onslaught. One might question the vision of the good life in the Bay Area now that the number of cars has nearly overtaken the number of inhabitants. Interstate 80 (just beneath the foreground of the photographs) is the most overburdened freeway in America. Road rage, red-light running, and two-hour commutes are now a part of daily living. Since 1971 the Golden Gate Bridge District has quietly run its own ferries from Marin to San Francisco to take pressure off the bridge. And there is talk today, from the highest San Francisco business circles, about bringing back more ferries. San Francisco Bay is the saving grace of the urban region, delivering fresh air and long sight lines for the famous civic views. Without the bay, everything would run together as it does in Los Angeles. The waters are by no means featureless. The bay is liquid analog to the ever-changing skies. Its colors never rest. No mere reflections of luminescence above, they have their own curious shading, the work of cloud, tide, sediment, and wind. The bay fills a valley created by the schism between the San Andreas and Hayward Faults, flooded by the last worldwide glacial meltdown 10,000 years ago. Every day recapitulates the oceanic drama of filling and emptying. The tides carry one-sixth of the bay's volume in and out of the Gate, where currents hit an astounding peak flow of 4.6 million cubic feet per second (seven times the volume of the Mississippi). Local sailors learn to read these currents, which regularly exceed seven knots and create a nasty chop where the winds oppose the ebb tide. But the steady breezes make for superb recreational sailing. The Golden Gate is also the mouth of the Sacramento River, where the ancient river cut a gouge 350 feet deep through the Coast Ranges. Its geography sweeps far outside the photographic frame, through an inland delta and nearly half the drainage area of California. Ninety percent of the inflow comes from the Sacramento-San Joaquin River system, in streams rising as far away as Mount Shasta and Kings Canyon. Ships arriving in winter can detect the river's brown discharge miles offshore. Without that flux, beaches along the coast would soon dissolve into the greedy waves. But it leaves a vast sandbar outside the Gate, creating the turbulence known as the Haystacks. San Francisco Bay Area and Delta. The bay is remarkably shallow (only six feet on average), making it easy to fill. Extensive diking and filling has shrunken it, reducing the open water area from 800 to 500 square miles. Of the 300 square miles of brackish and salt marsh that once fringed its shores, around 20 percent remains along with 100 miles of diked wetlands and 60 miles of salt ponds. The Sacramento River delta, once an ocean of tule reeds and sloughs, has had 97 percent of its 550 square miles of freshwater marsh diked off and plowed under. Developments upriver have touched the bay profoundly. Hydraulic gold mining in the Sierra once clogged the rivers with mountains of gravel and raised the bed of the upper bay by a yard. Giant dams such as Shasta and Oroville have reduced winter peak flows, affecting bay circulation all the way to San Jose. Most importantly, the waters flowing into the estuary are diverted into the world's largest plumbing system. The rivers are worth their weight in tomatoes, rice, almonds, and lobbyists. Their water is used intensively by Central Valley agribusiness: 80 percent of the Sacramento and an unreal 120 percent of the San Joaquin. Sacramento water has to be pumped south to replenish the exhausted San Joaquin and depleted groundwater stocks beyond. About 40 percent of outflow is diverted, some as far as San Diego. Our placid view of the Golden Gate gives no hint of the furious conflicts over water upstream, and water politics have an unparalleled resonance around the bay. A Peripheral Canal to take more water around the delta was overwhelmingly defeated by referendum in 1982. Opposing forces have been deadlocked since, because there is simply not enough water to go around. The ocean has not escaped the effluvia. For decades, acids and low-level radioactive wastes were dumped off the Farallon Islands; some 50,000 barrels still lie there, rusting. (5) The most egregious vandal was the US Navy, which brought contaminated ships back from South Pacific atomic test sites in the 1950s, washed them into the bay, then scuttled them offshore. Today, red tides off the coast are becoming more frequent; one in 1995, the biggest since 1902, was more than five hundred miles long. The cause? Nitrogen urea in storm runoff from city dogs and agricultural fertilizers and livestock. In recent decades, the ocean and bay have gained a much greater degree of protection. In 1972, the South Bay wetlands were designated a national wildlife refuge and the National Marine Reserve Act became law. Today, a set of three marine sanctuaries touch outside the Golden Gate: the Gulf of the Farallones, Cordell Bank, and Monterey Bay. Together they cover 7,500 square miles, and the United Nations has designated all three as a World Bio-Reserve. If these photos had been taken a hundred years ago, the scene would be crowded with ships. San Francisco, the instant city, was catapulted into the mainstream of world commerce after the Gold Rush. Thousands of ships entered the bay carrying men and materials for the gold fields, and gold and silver exited to the four corners of the earth, lubricating the wheels of Victorian commerce. The names California and Golden Gate flew round the world, magical incantations of adventure and good fortune. As California developed, so did the traffic through the Gate, the finest natural port on the West Coast. Cargo flowed to and from the Orient, South America, Hawaii, and the Atlantic. Precious metals from California paid for food, supplies, even houses. But soon California had its own products to sell. The wheat trade to Britain and China was the most voluminous, filling hundreds of clipper ships headed round the Horn. But the export of mining equipment was the most influential, as it carried advanced mining technology around the world. By the twentieth century, San Francisco's exports had diversified into a greater variety of machines, hardware, metals, and wood. Most important were its foodstuffs, mostly canned fruits and vegetables supplied by the state's well-capitalized agriculture. The city's shippers controlled the Pacific sea-lanes and their keystone, the Hawaiian Islands. From the opening of Japan to the seizure of the Philippines, San Francisco was the American portal to the Far East. Yet San Francisco was soon besieged by challengers, especially Japan and rival cities on the Pacific Coast. Worse, trade began to retreat everywhere after World War I as the European system imploded. The waterfront was on the decline by the 1920s, before trade nose-dived in the Depression. Only the rising tonnage of oil to upriver refineries kept the bay in the running among West Coast ports. After the Second World War, trade revived, but shipping shifted over to the Port of Oakland, the first on the West Coast to adopt the new container system. San Francisco's dozens of elegant finger piers and warehouses fell into disrepair. Oakland was in turn surpassed by new terminals in Los Angeles and Seattle, although it remains the fifth largest container port in the United States. It still exports high-value electronics and food products, but serves mostly Northern California markets. One sees more sailboats than ocean vessels on the bay these days. The economic geography of trade and transport is held in place by the force fields of geopolitics. The Golden Gate has always been a portal leading outward to the coveted realms of the Pacific Rim. At the apogee of San Francisco's power, the language of local boosters was a vicious celebration of racial superiority and industrial prowess. The myth of San Francisco's cosmopolitan encounter with Asia conveniently whitewashes a conflicted history at the collision point of Pacific nations and the brute heel of white supremacy. Imperial cant reached its zenith at the Panama-Pacific International Exposition of 1915, which took up the entire Marina district (built on bay fill). The exposition celebrated the rebuilding of San Francisco after the great earthquake and fire of 1906, as well as the opening of the Panama Canal. The canal was predicted to restore the shine to the Golden Gate's oceanic commerce, but the exposition proved the vainglory of the global traders' modern cargo cult. It was one thing to kick the Chinese and Japanese out of California, but quite another to supplant them in Asia. The terrible consequences of expansionist hubris, on both sides, was laid bare by the carnage of World War II. The war left Japan and China in ruins and the United States astride the globe. In the Cold War era, California moved again to the center of American aspirations and terrors. The military technologies coming out of the Lawrence Laboratories and Silicon Valley — from the Atomic bombs to Star Wars lasers — transformed war itself (and rendered obsolete the conventional military installations around the Bay Area). 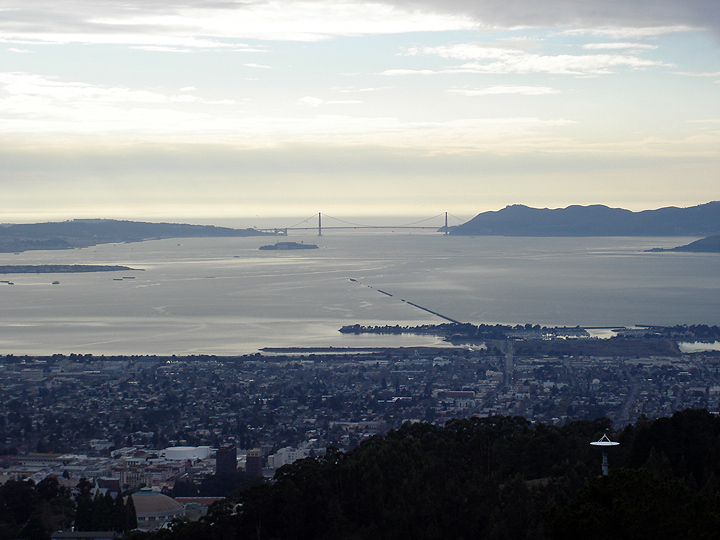 Lawrence's original lab nestles in the Berkeley hills, with the same view of the Golden Gate as in our photographs. Today, it is the peaceful conquest of the global economy by Silicon Valley that captures the headlines. The explosions of innovation flying outward from the high-tech capital of the world have swept across the Pacific, linking Asia and California into close networks of electronic production and trade. Equally have they mowed down competitors in Japan, Europe, and the Third World, proclaiming a New Economy for the twenty-first century. Trade and commerce have taken to the Internet, and no place is more hooked into the New Wired Order than the Bay Area. Sky dominates these photographs. In the immensity of these skies, the city dissolves away, and the Golden Gate is reduced to a filigree along the lower boundary of immense cloud formations. Even the clouds tell a story. They are the forward legions of the mighty Pacific hurled against the land. Their power is the power of the world's mightiest ocean, and here the sea is far from tame. Just as the Golden Gate is the breach that lets the ocean rush in and fill the bay, it also lets the sea air and clouds flood onto the landscape. In the far away North Pacific, moisture lifts skyward with the rising air and condenses. The prevailing westerlies blow the clouds across North America and on to Europe and Asia, aided by the higher level winds of the jet stream. Where the cool rising air collides with the warmth from the south, storms are born. The Gulf of Alaska is the brood sow for all the winter storms circling the Northern Hemisphere. Storms thousands of miles away leave their calling cards as the enormous swells encountered outside the Golden Gate. The waves at Mavericks, twenty miles south, are known to surfers as the largest and most dangerous in the world. In spring and summer come the coastal fogs that define San Francisco in the public eye. Upwelling from the deep Pacific chills the air, raising a bank of low clouds that hunches outside the Golden Gate. The California Current, running down the coast from Alaska, twists outward from the land, causing colder waters to rise from the depths. Inland warming as the sun moves higher in the sky draws Pacific breezes into the bay and upriver into the baking Central Valley. The fog follows as far as the East Bay hills. Being a global climatic borderland does not leave California in peace. The jet stream, making its sinuous course around the world, likes to play crack the whip against the Pacific Coast in some winters, and hide-and-go-seek in others. Even in our rainless summers, when it falls back before the high pressure ridge lying offshore, an the endless sequence of fronts moving out of the Pacific influence local clouds, alternately shrouding the Golden Gate in fog for days and leaving it exposed to the full glory of the sun. By August the fog abates as the offshore upwelling slows, and the ocean warms a bit from its cool 55-degree average. Clear days prevail. Something new entered the air over the Golden Gate in the 1910s, when the Bay Area became a playing field for aircraft. Amelia Earhart and other pioneers of aviation took off to challenge the vast Pacific. By the 1930s, San Francisco was the pivot of the Pacific routes. Air transport exploded during and after the Second World War, forcing the city to build a new airport on the peninsula. Today, SFO is one of the great airports of the nation, the fifth largest hub in the country, wheeling more than 16 million passengers; with Oakland and San Jose added, the total is more than 25 million passengers a year. SFO is still a vital portal to East Asia, where business is booming and Bay Area companies are busy investing, trading, manufacturing, and advising. How sylvan the borderlands of this regal pose of bridge and sky! The Golden Gate here appears as a veritable Eden by the western shore. There is little in these photographs to remind us that this picture-perfect world lies in the middle of one of the great urban complexes on earth, ground zero for 7 million inhabitants. The landscape flanking the bridge lies largely within the confines of the Golden Gate National Recreation Area. The park is presented to tourists as an apotheosis of good government, drained of all political content. But GGNRA is no more than a bureaucratic shell, created to encompass lands already saved. The real preservation work was done by Bay Area environmentalists, who in the process engendered the first mass green political movement in history. That mighty political animal has hung onto those verdant shores with the tenacity of an abalone. If the environmentalists had not succeeded, our idyllic photos would show a Golden Gate flanked by houses on the Marin headlands and Angel Island, high-rises in the Presidio, a space needle on Alcatraz, a second bridge veering from Fort Mason to Sausalito, and fill reaching to the end of the Berkeley pier. The movement that saved the land began as an effort to save the bay. After decades of diking and filling, dams and sewage, overfishing and dredging, the bay had become a shadow of itself. The assault reached a fever pitch during the Second World War, when the navy extended bases, old and new, far into the water. It took over Treasure Island (just beyond the left edge of the photographs) which had been filled for the 1939 World's Fair. Wartime shipyards in Richmond, Alameda, and Sausalito added to the expanding shoreline. Private development entered a new phase of New Town building, such as Foster City and Harbor Bay Isle on South Bay wetlands. The grandest bonanza of all, the Rockefeller-Crocker plan for Redwood Shores, would have cut down Mount San Bruno on the San Mateo county line to dump 200 million cubic yards of dirt in front of Redwood City. The apotheosis of lunacy was the Reber Plan. It would have dammed the North and South Bays and filled the Central Bay shallows for industry, an airport, and a ship channel. This was only one of many wild-eyed proposals for dams, barriers, bridges, and freeways at war's end. The Army Corps of Engineers drew up a map of all reclaimable lands in the bay which showed nothing left but a few narrow channels. The bay's disappearing act did not go unnoticed. Opposition was set in motion in the early 1960s by Berkeley's Kay Kerr, Sylvia McLaughlin, and Estar Gulick, who formed the Save the Bay Association. They mobilized the whole of Bay Area opinion and forced through legislation establishing the Bay Conservation and Development Commission in 1965, halting bay fill and increasing public access. Landward, developments were no less spectacular. New freeways were drawn up to encircle the bay and cross it two more times. Most controversial were those along the San Francisco waterfront, across Golden Gate Park, down the spine of the peninsula, and up the coast of Marin. Gigantic housing projects were set for Bolinas Lagoon, Tomales Bay, and the Palo Alto foothills, among others. The most bizarre proposal was to detonate an atomic bomb underground at the Marin headlands to form a bowl for a new city. The environmentalists fought back, creating a Green Revolution. It began with a revolt against more freeways and bridges, spread to agricultural zoning and growth controls, and was locked in as new parks, open space preserves, and urban limit lines. Marin county led the way, having Angel Island made a state park, Point Reyes a National Seashore, and the whole western slope of the peninsula protected grazing and watershed land. Napa downzoned its vineyards, the East Bay expanded its regional park system, and the Peninsula created an Open Space District. GGNRA was cobbled together out of the Presidio, Alcatraz and abandoned military bases on the Marin and San Francisco headlands. These initiatives were led by groups such as the Committee for Green Foothills, People for Open Space, and the Save Mt. Bruno Committee. 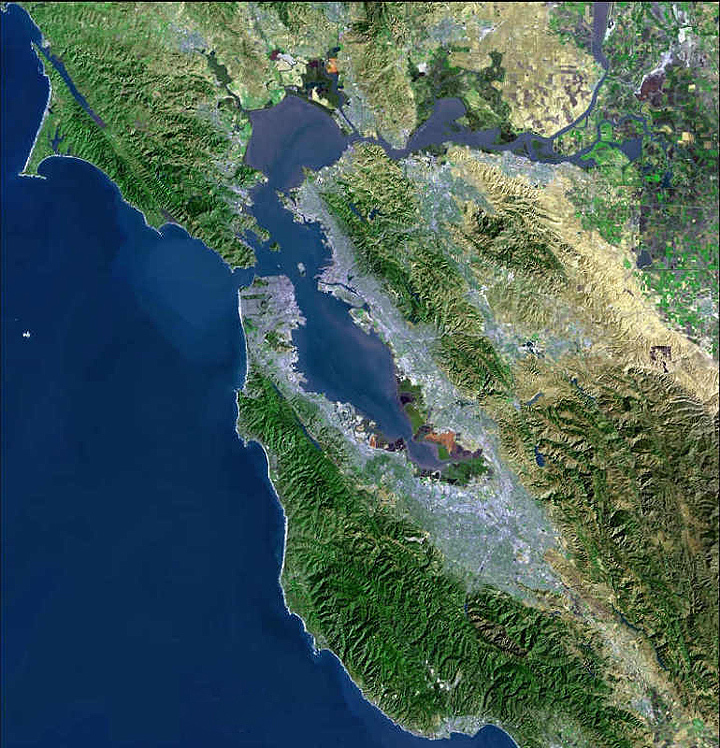 The result was a circle of parklands around the Bay Area which has made it the greenest of large American cities. Yet the greensward one sees is by no means a natural landscape. The vegetation has been as radically altered as the bay ecology. The woodsy Presidio, for example, was once spare grass and shrub with the odd native cypress, before pines and eucalyptus were planted in the 1880s in a military beautification program. Conversely, Angel Island had a thick carpeting of woodland that was stripped over the years, then was replanted with non-natives on its bare slopes. The Marin headlands give the best flavor of the natural patchwork of California coastal vegetation: oak-madrone woodlands in vales, grasslands on flanks of hills, and chaparral shrub in between. On the western slopes, patches of redwood and Douglas fir. The flats around the bay were once open savanna of plentiful oaks surrounded by a sea of grass. In the nineteenth century, Eurasian annual grasses were introduced to support cattle, which destroyed the native perennials by overgrazing. The native grasslands were forever transformed into the telltale look of modern California: lush green in the rainy season, dead brown in the dry. Today's environmental protection battles turn on subtleties, thanks to advocates from BayKeeper and the California Native Plant Society. Crissy Field (just below the Presidio) has been turned back into a salt marsh and coastal shrub. Angel Island's southern slope has been returned to grasses and chaparral. The Presidio's faux forests are slated for recreational trails. At Fort Funston, native plants and birds are being protected from incursions of free-range dogs. Alcatraz is reverting to a bird rookery, with netting to protect nests from marauding ravens. Nature and history are taken in measure in today's more sophisticated land management, but the efforts are no less deliriously utopian. John Frémont dreamed of riches as he gazed on the entrance to the San Francisco Bay, naming it after the Golden Horn of the Bosporus. (Fittingly, the name came to him chasing Mexican soldiers across the bay as he seized California for the United States.) The enduring image of the Golden Gate is still burnished by the glorious moment of the Gold Rush that followed. It is the California Dream of opportunity, wealth, mobility. The miracle of instant riches, successful entrepreneurship, and capital accumulation has been repeated in oil, machinery, farming, finance, and electronics. Newcomers continue to pour into the state in search of work, fortune, and freedom; not a single decade has passed since 1850 in which the number of people born in California has exceeded the number migrating from elsewhere. Of course, great wealth has never touched more than a few people, and the gains have been skewed toward those of northern European stock, but a surprising number of people from Portugal, Ireland, and Italy, from Japan, China, and India, have taken part in the unending gold rush. The Bay Area enjoyed yet another boom at the turn of the millennium, thanks to the triumph of webworld. Silicon Valley has morphed into Silicon Bay. The Bay Area now stretches continuously fifty miles in every direction from San Francisco, and its edges sprawl another fifty miles deep into the Central Valley, north to Mendocino, south toward Monterey. The region has become rich beyond Frémont's wildest dreams — higher income per capita, more billionaires per capita, and more new millionaires than any big city in the United States. Real estate values have taken flight, making housing more expensive on average here than anywhere in the country outside New York. If the view of the Golden Gate is central to the region's imagined geography, it is no less a part of its real estate. The idyllic scene works for the wealthy of Tiburon and Pacific Heights but is hard to see from the Tenderloin or East Oakland's flatlands. The View is most definitely for sale, and a house in the Berkeley Hills can be a million-dollar proposition these days. Pleasing prospects, indeed! The dream never cops to the broken men who came for gold and fled in misery, or died for naught. "Darling Clementine" was a miner's tune, after all. Homelessness in the midst of plenty is today's sorriest spectacle. But failure is not welcome in America. The Golden Gate Bridge has been a mixed blessing in that regard, once it became a favored staging ground for suicides and provided grist for endless speculation about the broken dreams left dangling at the end of a continent. Most worrisome is that ordinary working people have been fleeing the city in droves, burnt by scorching rent increases and the cosmic forces of the dot.com investment bubble. There seems to be no more room for the kind of people who built the bridges, drove the ships, worked the shore. Their labor is largely invisible in this idyllic landscape; soon they will be missing altogether. Where does this leave the dreams of the Golden Gate? Fortunately, the latest Gold Rush has receded, as they all do, and the best side of the Bay Area has been revealed again in a rebound of resistance to unchecked exploitation of people and places. Artists and Mission district Latinos banded together to protest displacement at the hands of the dot.coms. San Franciscans voted out a Board of Supervisors beholden to Mayor Willie Brown's growth machine. South Bay citizens are fighting Cisco Corporation and Stanford University's development proposals, while Sonoma County residents are up in arms over urban sprawl and tax-dodge vineyards. All around the Golden Gate, the need for vigilance remains, if this magnificent scene, this wonderful geography, is to remain for everyone to enjoy. Thanks to Nari Rhee for assistance and to Joe Matthews, Tim Clark, Richard and Miryam Misrach, and Iain Boal for critical readings. 2. "Miwok information", Angel Island Association, www.angelisland.org. 3. See California Prison Moratorium Project, www.prisonactivist.org. 4. Lai, Him, Genny Lim, and Judy Yung. Island: Poetry and History of Chinese Immigrants on Angel Island, 1910-1940 (San Francisco: Chinese Culture Foundation, 1980), 150. 5. Basic dimensions: central span 4,200 feet (1,280 meters); total length 1.2 miles (6,450 feet or 1,966 meters); towers 746 feet (227 meters); height above water 220 feet. See www.goldengatebridge.org. 6. Over 5.5 million cars for the nine-county area, which had about 7 million people in 1999. On the rise in vehicles per household, see www.abag.ca.gov/planning/trends/trendsk.html. 7. On bay contamination, see Communities for a Better Environment at www.cbecal.org. For efforts to monitor radioactive barrels, see http://walrus.wr.usgs.gov/farallon/radwaste.html. 10. 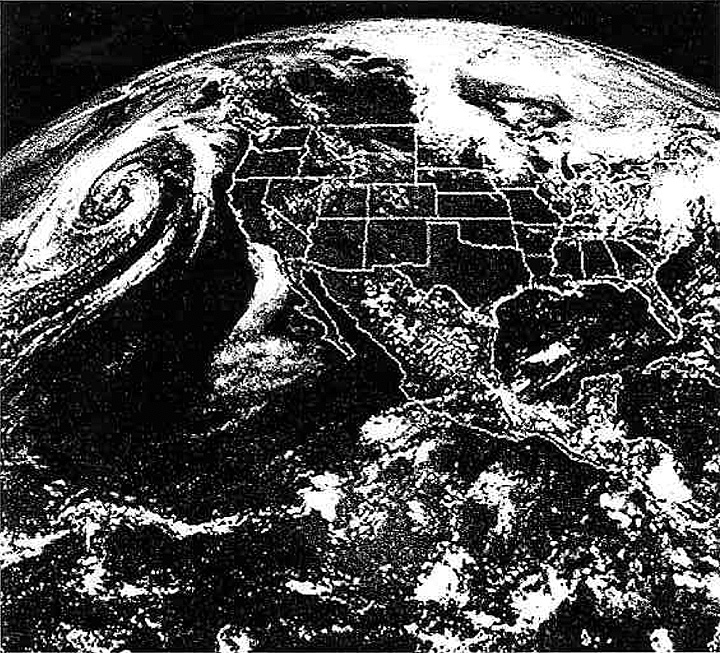 For satellite views of the atmosphere, see www.goes.noaa.gov. 12. Information about Bay Area open space can be found through the Open Space Council, http://openspacecouncil.org. 14. The number of suicides from the bridge stood at 938 in 1993. More people commit suicide than homocide in California each year, inversely to the fears of murderers and neglect of mental health support.